Shortly after completing her degree Shandana joined UNICEF as Programme Communication Officer based in Pakistan. She joined just in time to support a series of large scale emergencies including the displacement crisis in 2009 and 2010 floods, which resulted in nearly 2,000 deaths, affecting 20 million people across Pakistan. Since then, Shandana’s work with UNICEF has included emergency response assignments in Africa and as the Officer in Charge of Specialist Planning, Monitoring, Evaluation and Reporting. She is passionate about her work which in her own words “supports some of the most marginalized and vulnerable children facing life threatening and extremely challenging circumstances all over of the world”. 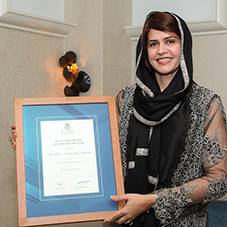 Shandana was the recipient of the 2017, International Alumnus of the Year.